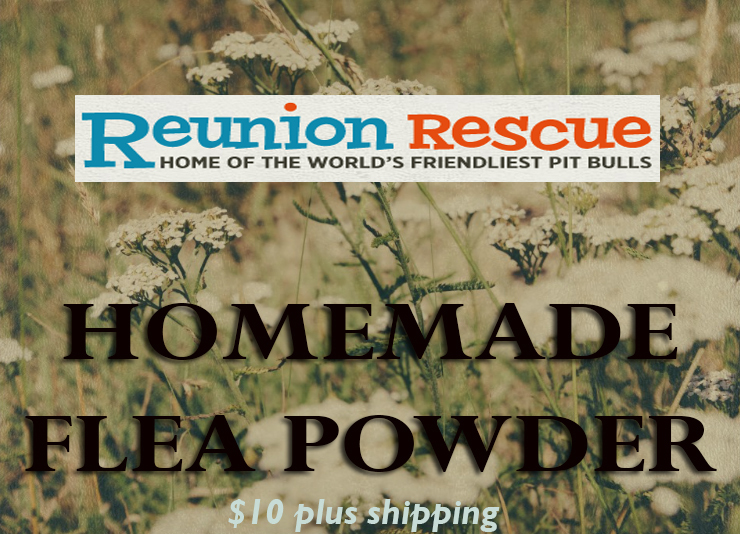 Reunion Rescue is the world’s only RAW FEEDING NO-Kill pit bull refuge. We are located on the banks of the Colorado River in beautiful Austin, Texas hill country. Although a raw-fed pet has a very strong immune system repellent to parasites and disease, we take that extra precaution with our homemade holistic flea powder. Made with edible diatomaceous earth, organic yarrow flower and neem powder with essential oils, it’s easy to apply and leaves your dog smelling good….the natural way! Only $10 plus shipping. Order today!